Working on our next big release for Transit, we came across the need to be able to give MKUserLocationView (a.k.a. that pulsing blue dot indicating the user’s location) a custom color. Problem is, that annotation view is private, undocumented and, more importantly, made up of resource artworks, making it very rigid to any kind of visual customization. This called for yet another exciting journey of replicating a stock UI element. Head over to GitHub to get the code. If you’re interested in the process I went through for recreating this class, read on. Now that I had all the graphical elements ported to CG code, it was time to implement and animate this bad boy. Here’s our MKUserLocationView. But what are all those sublayers? So be it, this is what my view hierarchy would look like (leaving aside the accuracy circle and heading angle for now as they aren’t needed for our use case). We can assume this is done to improve the ring’s quality throughout the animation. The good news here is that drawing the halo using Core Graphics makes it very easy to get that resource in various (and potentially additional) sizes. 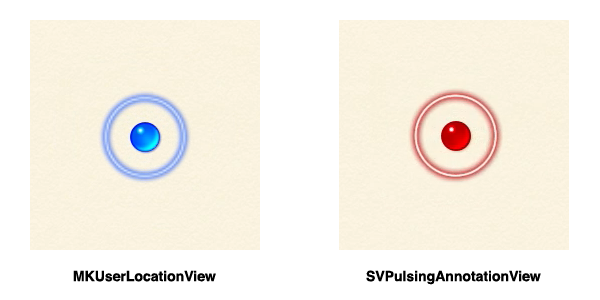 However, my Core Animation expertise being quite limited, I wasn’t really sure of how I would animate the pulsing ring’s size and opacity smoothly, all while replacing the halo itself throughout the animation. Oh look at that, it’s using CAAnimationGroup, which in turn contains 3 distinct animations. By encapsulating these 3 1-second animations into a 2-second animation group, a pause between each pulse can be made possible (something I always had wondered how to achieve). Now, what about these 3 distinct animations? Bingo. 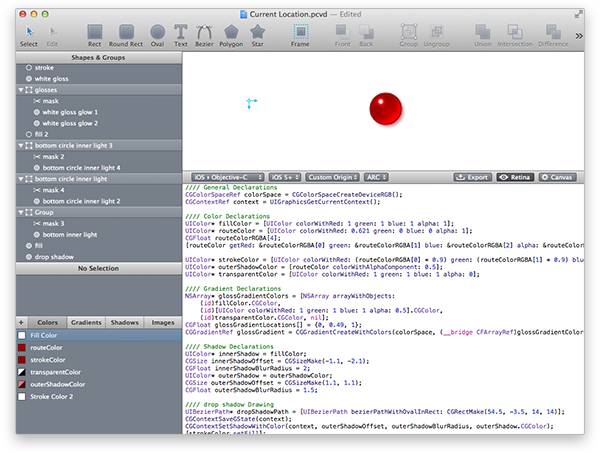 Here the first animation takes care of switching the layer’s contents property. We also get confirmation that MapKit is indeed using 3 different images throughout the pulsing animation. Also worth noting is that Apple isn’t using any fancy keyTimes setup for that transition to happen, but instead a simple CAKeyframeAnimation with its calculationMode set to kCAAnimationDiscrete. The second and third animations respectively take care of the scaling and fading. Notice how the scale animation is using an ease-out animation curve, whereas the opacity one is using ease-in. Recreating a stock UI element is an excellent exercise of introspection and attention to details. If you ever come across that need, I highly recommend that you take up the challenge. Hopefully, some tricks I shared here will help you along the way.